Lemonade is a Los Angeles chain, a cafeteria-style eatery built around a variety of salads and braised meats. They also do sandwiches, most of which appear to be straightforward offerings with faith in their own simplicity. 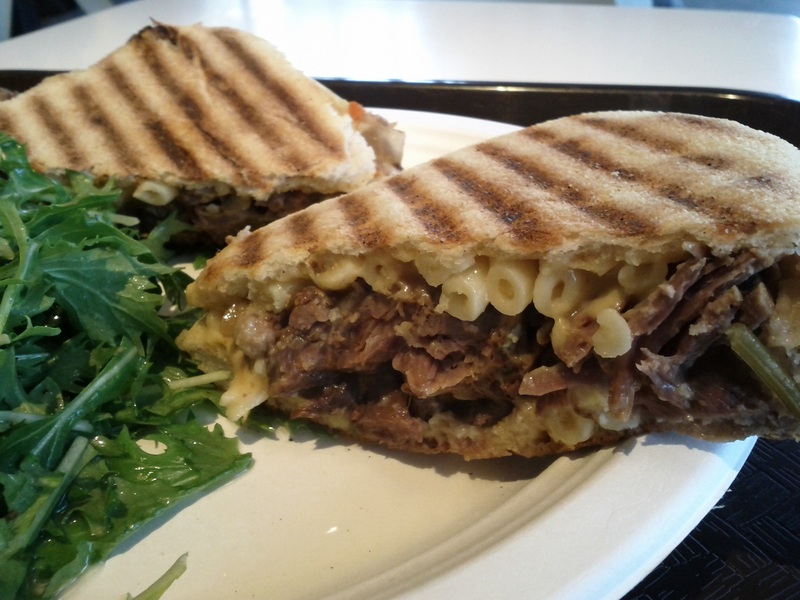 The short rib mac & cheese is a good example, as it’s nothing but pot-roasted short ribs and a helping of macaroni and cheese grilled between two thin sheets of ciabatta bread. There’s really very little bread at all, just a pair of crusts. I talk a lot about how awful things can be when someone just aims for ‘good enough.’ To my mind, being content with mediocre is unforgivable, and it would be easy to see this sandwich as committing just such a sin. It doesn’t, however, and escaping that fate is a result of some subtle touches. The bread is a good example of what they’re doing right, as it neatly avoids the pitfalls of starch on a sandwich. Most sandwiches deal strictly with a starch / something else / starch setup, and the reason they do that is because it’s what works. Bread, a contrasting substance, and more bread. That’s what a sandwich is. Adding a starch in the middle throws the whole balance off, and while many successful sandwiches incorporate some manner of starch (fried potatoes, usually), it’s a higher degree-of-difficulty. Lemonade solves this problem simply by stripping the bread to its bare essentials. There’s no fluff, very little chew, it’s just enough to hold things together. That’s the kind of thing that shows someone really thought this sandwich through. They didn’t simply slap two delicious ingredients together and call it a day. That makes all the difference, and ultimately one can hardly be accused of settling for good enough when the result is genuinely great. This entry was posted in Sandwich Reviews and tagged Beef, Los Angeles, Reviews by Pete, Sandwiches I Have Eaten by Pete. Bookmark the permalink.